Click here to book an escape room! Trapped in Video Game Land! You & your friends were at the arcade when suddenly the lights went out! Seconds later the lights came back on but you found yourselves trapped inside video game land. Can you find your way out before you loose all your lives? Wouldn't an escape room adventure be an awesome birthday present or Christmas gift? Click the "Gift Certificates Available!" title if you would like to buy a gift certificate for someone. 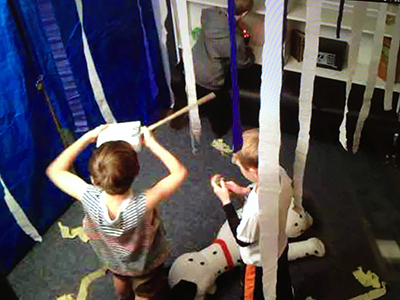 Kids Escape Room was created in 2017 by Carolyn & Keri from Piano Stars. 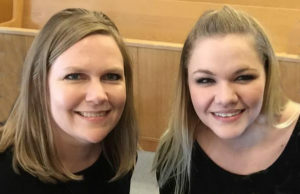 Carolyn & Keri have been running escape rooms for kids since Spring Break of 2017. Before that, they ran Spring Break & Summer music camps for kids since 2004. In their spare time, Carolyn & Keri LOVE to go to live escape rooms! 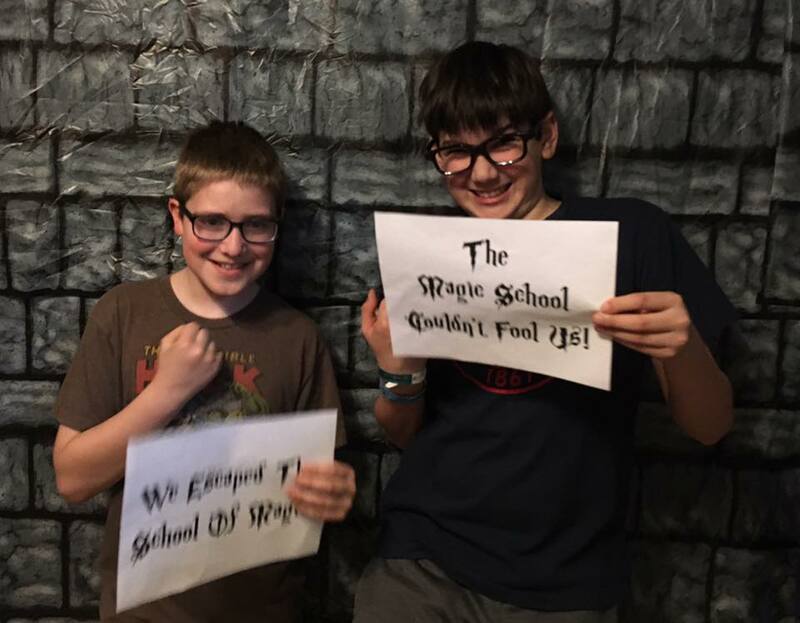 They have been to over 40 escape rooms! 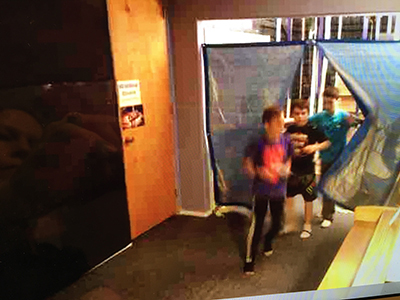 One day they thought "wouldn't it be awesome to create escape rooms especially designed for kids?!?". So they did. Each theme has multiple rooms to move through & include lots combination locks, key locks, door locks, combination safes & semi automated puzzles so there are lots of opportunities for kids to "get a turn" to do something. All the puzzles are related to the theme. Kids can ask for as many hints as they like. We do not just give the answer to the puzzle but we will give guidance to help them figure it out. 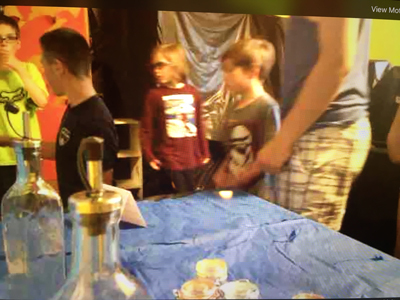 We run Kids Escape Room out of Carolyn's piano studio in her home, 27 Spruce Cres, St. Albert, Alberta. We make use of multiple rooms for a jam packed 50 min adventure. We send emails when we post new escape room dates. Visit our FaceBook page to see photos & comments from previous teams who have participated. Join our mailing list to be the first ones to know when a new theme has dates for booking. What do I do if I forgot what time I booked or I didn't receive my confirmation email? Please feel free to use the contact us form to ask for your booking details. You can also send an email directly to: fun@kidsescaperoom.ca After booking, you will receive a "pending" email. Once you make your payment, you will receive a "confirmation" email. The subject will be "Escape Room Booking" if you would like to search your email. Do I have to have a group of 6 kids to participate? No! We recommend you have at least 2 kids working together to make your experience more fun but any number from 1-6 kids at a time is allowed. Do all the kids need to be the same or similar age? No! Mixed age levels are allowed. Just keep in mind that older kids will generally be able to solve the puzzles faster than younger kids. If you plan to send multi-aged siblings/friends you might want to have a conversation about trying to let each other have a turn to open locks or help out in the puzzles. The escape room has over 10 puzzles & locks so there is lots of opportunity to have a turn to "do" something. Do you make the puzzles harder for older kids? Yes! We adjust the way we give hints & guidance depending on the age of the kids. We want the kids to be able to do the puzzles with as little adult assistance as possible. We will not just tell you where the key is, or what the combination is but we will help you figure it out. We ask participant's ages when you register so we can plan ahead. If there is a group that is really young, or much older, we may also adjust the puzzles in the room. Can I sign up now & tell you my friends' names later? You book a 50 min session for $40 for your group. You can have up to 6 kids in the group for that price. Feel free to divide up the cost between members of your group. If you have only 2 kids, its still $40. You can decide if you want less people so you can do more of the work yourself OR more people so you have more brains in the room to help solve the puzzles. Have Carolyn & Keri made escape rooms before? Yes! 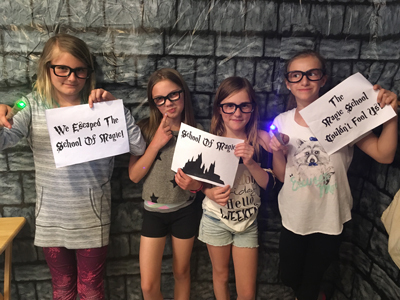 We have been creating escape rooms for kids since 2016. We stared out during our 2016 Spring break & Summer camps for kids. 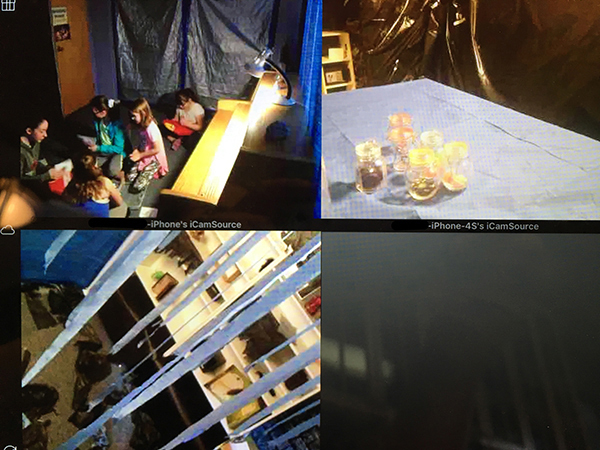 We incorporated a live escape room theme in all of our camps. 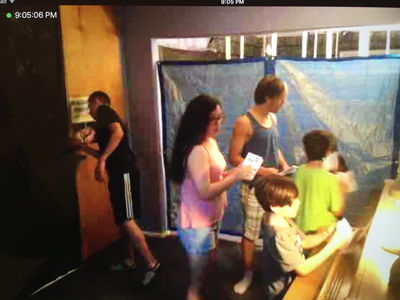 We set up many different music c themed escape rooms for the kids during the camp weeks. 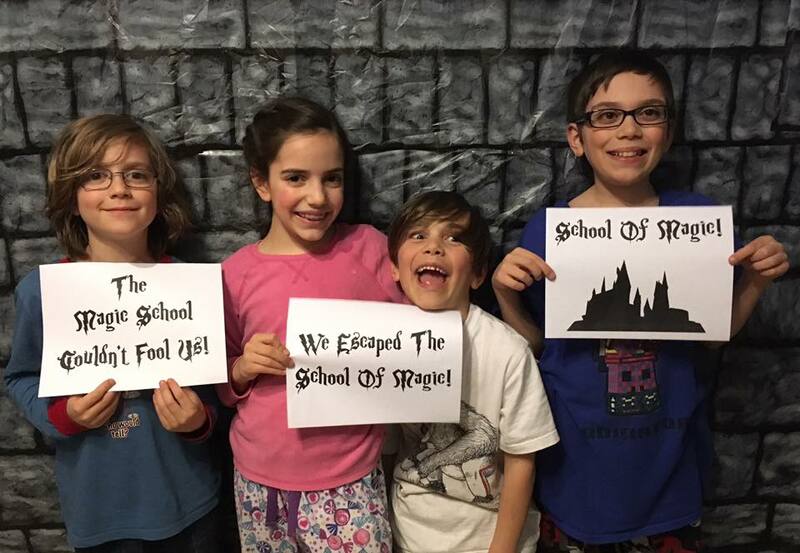 During Spring Break of 2017 we set up "Mystery at Magic School" which did not have music related clues & was a huge success! In summer of 2017 we hosted 4 themes: "Welcome to the Jungle", "X marks the spot", "The Science Lab", & "Ready, Set, Glow". They were so popular we have decided to continue on with a new theme every 4-6 weeks. Scroll to the bottom to see previous themes. Scroll up to see current themes. What do the parents do while the kids are in the escape room? Where are Carolyn & Keri (the supervisors) while the kids are in the escape room? We will be in the next room watching & listening to everything through a video monitoring system. We can give hints through a walkie talkie & if necessary, can pop into the room at anytime. How many hints do we get? You can ask for as many hints as you like. We won't just give you the answer right away but we lead you in the right direction so you can easily get on to the next puzzle. No! Not at all - this escape room is for kids! Some area's may be a little darker so the kids can use flashlights but nothing will pop out at you or be scary to look at. Do I have to be a piano student of Carolyn or Keri to participate? No! All kids from anywhere are welcome to sign up for our escape room. There is nothing music related about this room except for the fact that it's in Carolyn's piano studio. But we promise we won't make you practice the piano! Payment by credit card, pay pal, e-transfer, cash or cheque is required within 48 hours of booking to confirm your escape room adventure. Plan for your group to arrive approximately 5 min before your start time so we have time to run the rules of our escape room & give you your mission.